CCC's Halo 3 Launch Realm: Welcome Back, Master Chief! Welcome to CCC's Halo 3 Launch Realm, with all the info about Halo 3, exclusive videos, articles, and more! Don't miss it, you'll find it all right here! Halo 3 is the third game in the Halo Trilogy and will provide the thrilling conclusion to the events begun in Halo: Combat Evolved. Being the most anticipated title this year, Halo 3 marks the return of Master Chief and the first time fans will be able to play co-op with three other friends to "Finish the Fight." 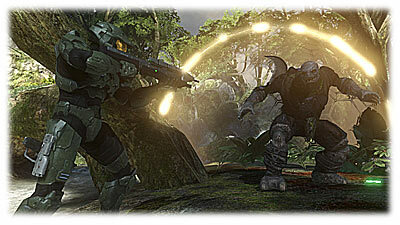 Using a variation of the Havok engine, Halo 3 will bring a new level of interactivity to the series. Everything from barrels to the foliage of the environments will be reactive to the player and other various elements of the game. Make sure you have Apple Quicktime installed. It's time to Finish the Fight and show CheatCC how good you really are!